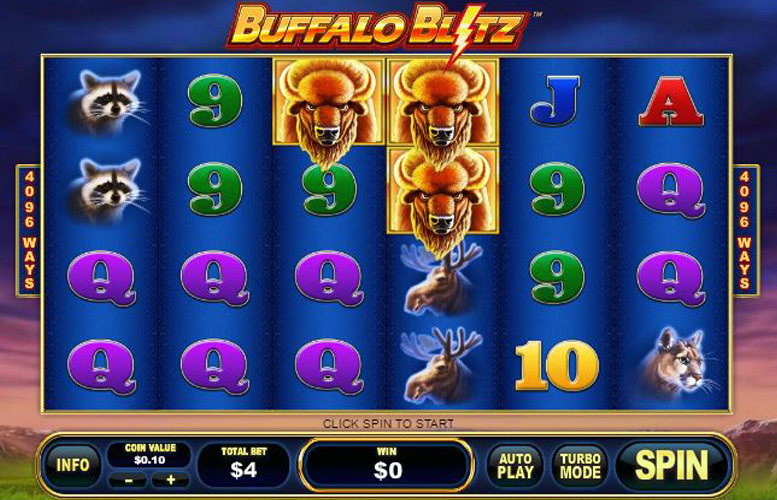 Innovatively formatted and interestingly themed, Buffalo Blitz is a six reel, four row and 4096 ways to win slot which is sure to have players positively stampeding toward their computers or smartphones to give it a try. Boasting a host of majestic animal symbols, including the eponymous Buffalo, the slot also features wild substitutions and free spins with random win multipliers to add extra fun and winning potential to gameplay. 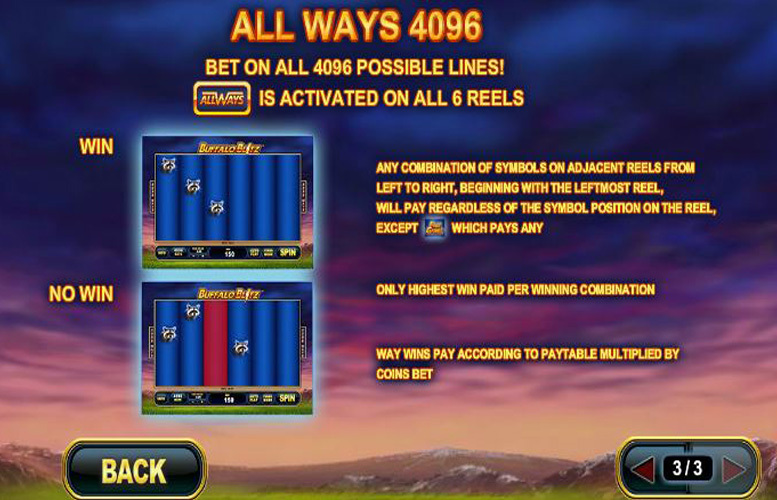 The unique six reel, four row and 4096 ways to win format of Buffalo Blitz helps it to stand out from the crowd and means that winning combinations appear comparatively regularly. Wild symbols help to increase the chances of winning combinations still further and random win multipliers during free games generously increase the size of jackpots. The unusual theme and related attractive animal symbols make the game really easy on the eye. Payouts are comparatively small, even for the game’s most valuable combinations. Without a bonus round or side game gameplay can get very repetitive and rather dull. The range of stake options for each spin is relatively limited, meaning that higher rollers are likely to be discouraged. As is the case with most slots that adopt a ways to win rather than traditional payline format, the top jackpots available through Buffalo Blitz are comparatively small. That’s because the ways to win format does mean that far more winning combinations can result at once after a successful spin. The highest possible jackpot that a Buffalo Blitz player can win, results when a buffalo symbol appears on each of the six reels at the same time, in any combination. The payout related to that combination is worth 300 times the chosen coin value, which means that the jackpot can reach a value of £1500 at the maximum coin value of £5. 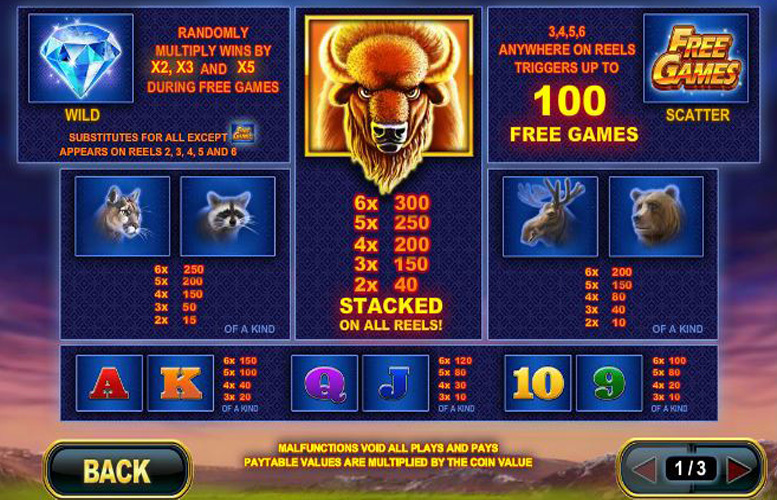 Aside from its generally innovative format, Buffalo Blitz also boasts a handful of additional game features. These are namely its wild symbols and its free games symbols, which trigger free games that can be subject to random win multipliers. Showing off an image of a sparkling diamond, the Buffalo Blitz wild symbol can appear on all but the first reel. When it does appear, the wild can substitute for all other symbols apart from the free games scatter, in order to make up the most valuable possible winning combinations for the player. During free games, too, the wild has an additional role which will be explained below. If three or more free games scatter symbols appear as a result of a player’s spin, they will receive a selection of free games. How many free games are triggered depends upon how many scatters appear, with a maximum of 100 able to be triggered when six scatters appear. During free games, when wild symbols appear they randomly apply either a x2, x3 or x5 multiplier to any wins as well as performing their usual substitutions. Other than the pair of special symbols described above, the other symbols on the Buffalo Blitz reel either depict images of different animals, letters or numbers. The most valuable of the symbols, when it comes to the size of jackpots from winning combinations, are the animal symbols. Behind the most valuable buffalo symbol, the next best symbols are those showing images of a mountain lion and a raccoon. Any successful six symbol combination of those symbols pays out at a rate of 250 times the coin value. Buffalo Blitz’s 4096 ways to win are all always active, meaning that the only way players can alter the amount they wish to bet per spin is by selecting their chosen coin value. There are a selection of different available coin values from a minimum of 1p up to a maximum of £5. In order to account for the 4096 ways to win, too, a player’s chosen coin value is always multiplied by 40 to make up their total bet per spin. That means that the minimum overall bet per spin is 40p and the maximum is £200. Offering a different option from the many payline based slots that are around, Buffalo Blitz boasts an innovative format and a fun theme. The slot also offers players the chance to achieve relatively regular payouts and introduces wild symbols, free spins and random multipliers to enhance the size of those jackpots. In spite of the unique format, however, after a while players are likely to find Buffalo Blitz to be a little staid and repetitive. There are no bonus rounds or features, after all, to add extra interest to gameplay and as such the game is very straightforward. As well as that less than exciting gameplay, players may also be a little disappointed by the size of jackpots offered by Buffalo Blitz. A top payout of £1500, after all, is on the low side but the 4096 ways to win format does mean that a great many winning combinations can result from just one spin. This game has a rating of 3 / 5 with 406 total reviews by the users.